Software Androit ini perlu dimiliki untuk mengedit video di kamera atau tablet kita yang berbasis Android. 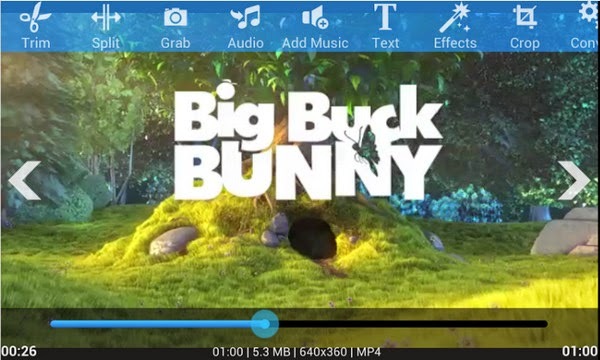 Fasilitasnya yang tersedia meliputi (dalam bahasa aslinya): Trim, merge, split, transcode, add music, add text, apply effects, grab video frames, make slideshow, share your videos, convert to many audio and video formats. AndroVid Pro is the ad-free, commercial version of AndroVid application. You can try all PRO features in the Free version. Before buying AndroVid Pro, please try the free version first, because some features may not work on your phone. REFUND POLICY: 15 minute is very short to try all features. We extend it to 24 hour. If any feature is not working on your phone, please send email to androvid@androvid.com for refund within 24 hour after buying. - Trim your videos and produce clips. - Share your video clips and grabbed video images. Upload your videos to facebook, youtube etc.